CHILASA IS EXPANDING: 35x GROWTH IS A GREAT START! Karpagam, is the women entrepreneur with the big smile and wearing the green sari in the photo. There is good reason for the smile. Since being selected for Chilasa’s Small Business Accelerator (SBA), Karpagam has grown the revenue of her micro enterprise 35x, created 3 new jobs in her village, and helped to increase the household income of 100 vegetable producers. She began with a small plot of land growing her own vegetables, now she is in the distribution business with ambitions to expand even further! We launched the Chilasa SBA project in 2013 to provide a solution to the problems and limitations of microfinance. Businesses like Karpagam’s cannot grow because microfinance loans are too small, and entrepreneurs need much more than financial support to succeed. Too many entrepreneurs like Karpagam get stuck on the treadmill of subsistence level activities. These enterprises fail to generate employment and economic growth, because the technical, mentoring, and financial support simply does not exist. 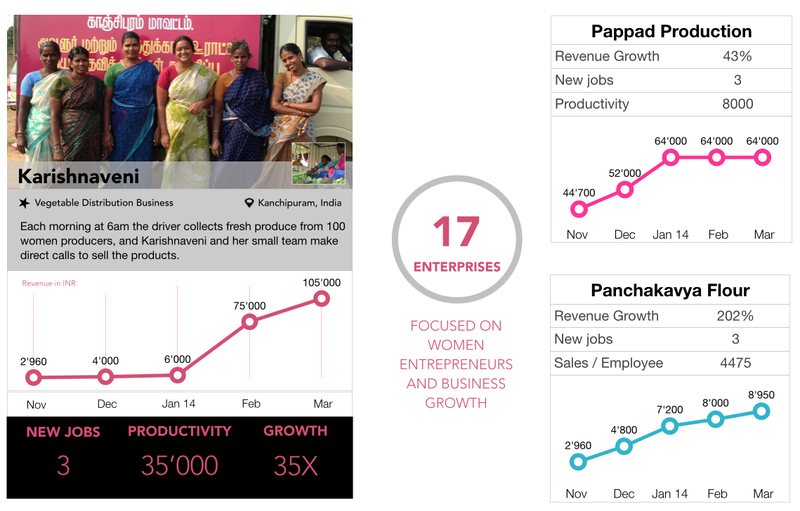 There are 30 million micro and small enterprises in India like Karpagam’s business, and more than 70% of these have unmet demand for financial and business building support. Helping families and communities lift themselves out of poverty requires that we unleash the potential of small growing businesses. One of our recent accomplishments has been to establish a pipeline of 10’000 micro and small enterprises that have requested growth finance and business building support. The majority of these require debt financing. To seize this opportunity I am very pleased to announce the launch of a second round of financing with an initial target of USD$1.5m. These funds will help support 10’000 women led enterprises, create 15’000 jobs, and leverage over USD$6m in local funding in India. Karpagam is a catalyst of transformation, helping her family and community lift themselves out of poverty. Your support can be the difference between the treadmill or transformation. If you would like to learn more about our plans to create 15’000 jobs, and discuss how you or your organization can be involved please contact me for further details. The Small Business Accelerator provides finance, capacity building, and on-going mentoring to help selected women entrepreneurs develop their micro enterprises into small businesses. The project was launched early in 2013 to develop a disruptive solution to poverty that creates economic growth beyond microfinance. The enterprise performance data (3 examples above), show encouraging growth including new job creation. The exception is the dairy production that only shows a marginal increase. Karpagam’s vegetable distribution enterprise is the outstanding performer during this first evaluation period. We helped the entrepreneurs with business planning and linked them to potential customers, as well as useful contacts in the local government departments. Going forward, we have identified book keeping and sales pipeline development as two key areas of skill development. 12 more enterprises have recently been added to the portfolio including food process units, bicycle rental and repairs, screen-printing, and fashion jewellery manufacturing. Each month we collect 10 data points from the enterprises to help measure progress and impact. We analyze the results and use them to inform our decisions regarding the capacity building efforts required during the following month. Building this kind of data bank of knowledge is at the core of our long-term plans for scaling Chilasa’s impact throughout India and in other countries. We are extremely pleased to announce the equity investment into Ecoway Bricks. 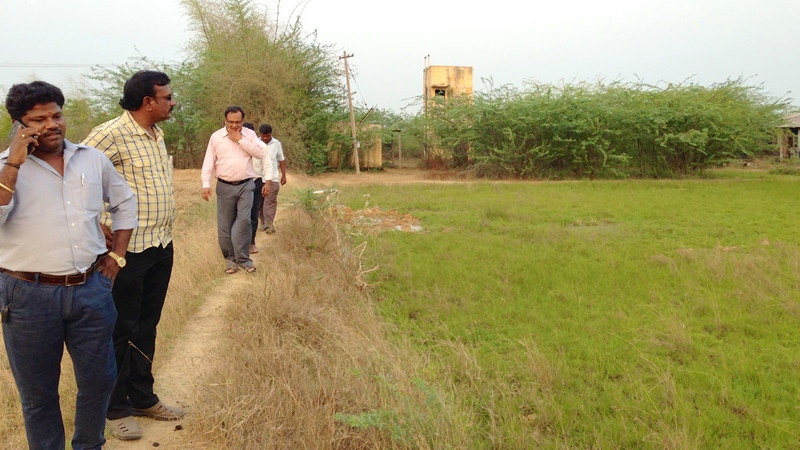 The photo shows a recent field visit with Ecoway entrepreneur G. Gopalakrishan (2nd left), to see the new site for the manufacturing unit. If you missed the press release click here. The Book Binding Unit is a social business that prints and binds educational materials for schools in Tamil Nadu. The business was developed by a charity to directly support the operational costs of the Friendship Home for children living with HIV Aids. A catalyst grant was made in 2013 to pilot the new business model which involved the purchase of machinery and a new facility. The enterprise has recently become operational and the sales order book is growing, as the photo shows! Organic fertiliser company. We are in the final stages of closing a new equity investment into a small growing business producing a range of bio fertiliser products for small farmers. Organic animal health and nutrition business. This is an established family business with a generational change in leadership located in a small rural town. Animal health and nutrition is critical for the productivity of small farmers and food security in developing countries. We are currently conducting a product and market analysis. Early indications look positive. Milk chilling and processing unit involving 1’700 producer families from 35 villages. This is a special situation requiring a restructuring of the business. The social impact potential is high. Discussions are ongoing. 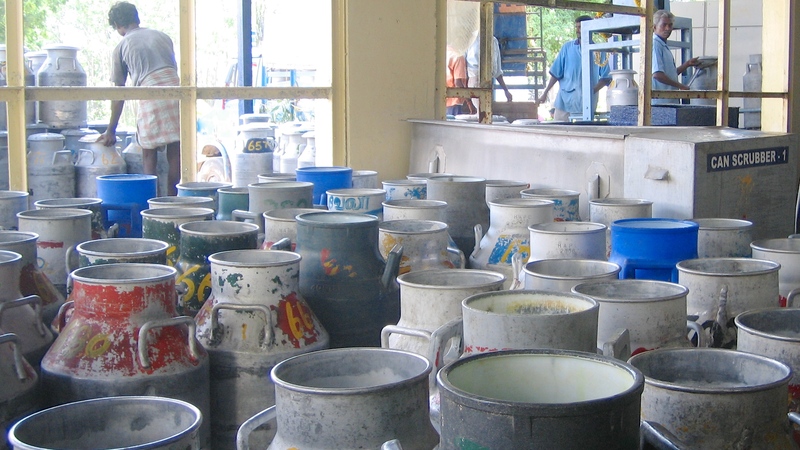 A community based recycled paper company with demand for products that outstrip their ability to supply, requires support to upgrade and expand the production capacity. The project will create 100 jobs and the profits from the business will help support the education of 500 children in the local school. Click here to watch video a short video. Our Impact investment opportunities can be accessed through the Chilasa Angel Network. To request more information about Chilasa Angels click here. Our mission at Chilasa Venture Philanthropy is to break the cycle of poverty by building sustainable enterprises that create jobs and drive economic growth in under-served communities in the developing world. Chilasa is focused on solving the problems of micro and small enterprise growth by turning innovative ideas into scalable solutions. We work with entrepreneurs to provide access to finance, new markets, capacity building and technical support. Chilasa Venture Philanthropy is a non-profit organisation funded by charitable grants.